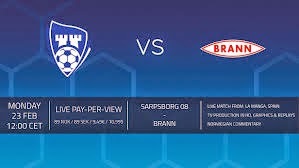 Sarpsborg 08 will play hosts to Brann in this game in the La Manga Cup. This cup is essentially a friendly tournament for certain european clubs which are on winter breaks. So far, teams have played at most 1 game in this competition. And that's the case for these 2 clubs today. Sarpsborg 08 opened their accounts with a comfortable 3-0 thumping of Sandefjord. Meanwhile, Brann was also involved in an opening match with the same scoreline of 3-0. But they were on the receiving end of those 3 goals. These 2 clubs meet regularly in the Norwegian league & Saprsborg 08 has often had the upper hand, winning 4 of the last 5 encounters with Brann. I can't hesitate to go for Sarpsborg win here with high stake and will get my stake back if they should draw.